My 15 year old gets easily bored with food, and for some reason he has an issue with chicken. It's not that he doesn't like chicken, it's just that he finds it boring at times, so I'm always looking for new ways to prepare it. 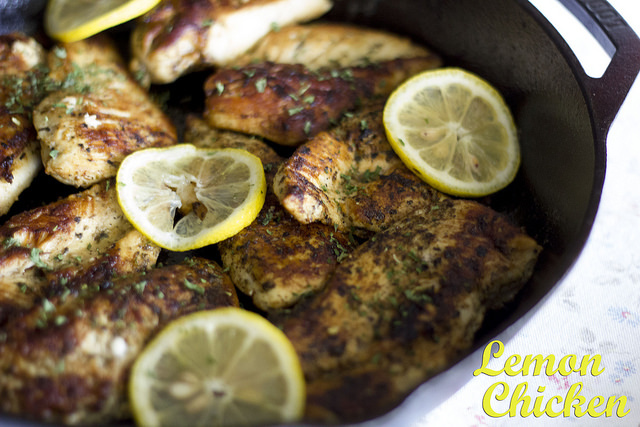 This is a super easy and simple way to make chicken in your cast iron skillet. It is chock full of flavor, and perfect with a salad, rice, mash or buttery garlic noodles which is what I served with it last night. If you're interested in how I make the noodles, I just cook them al dente, and feel free to use whatever noodles your family prefers, I use the same method whether I'm making spaghetti, fettucine, rigatoni or penne. Once the noodles are cooked, drain them and then add a tablespoon or two of butter, little drizzle of olive oil, chopped garlic (you can use powder if you don't have fresh on hand) and a sprinkle of parsley. That's it!!! Place the chicken breasts in a ziploc bag, add the remaining ingredients and shake well. Let rest in the fridge for an hour or overnight. Heat a cast iron skillet and when it starts smoking a little, add the chicken breasts. Discard the marinade. Cook for about 5 minutes on each side until nice and brown. Transfer to the oven, and bake at 400 for about 20 minutes or until chicken is done. To serve, sprinkle with fresh parsley and some sliced lemon. Serve with rice, mashed potatoes or pasta.